Arms of a Prince-Bishop with components from both princely and ecclesiastical heraldry. Bishops had been involved in the government of the Frankish realm and subsequent Carolingian Empire frequently as the clerical member of a duo of envoys styled Missus dominicus, but that was an individual mandate, not attached to the see. Prince-bishoprics were most common in the feudally fragmented Holy Roman Empire, where many were formally awarded the rank of an Imperial Prince Reichsfürst, granting them the immediate power over a certain territory and a representation in the Imperial Diet (Reichstag). The stem duchies of the German kingdom inside the Empire had strong and powerful dukes (originally, war-rulers), always looking out more for their duchy's "national interest" than for the Empire's. In turn the first Ottonian (Saxon) king Henry the Fowler and more so his son, Emperor Otto I, intended to weaken the power of the dukes by granting loyal bishops Imperial lands and vest them with regalia privileges. Unlike dukes they could not pass hereditary titles and lands to any descendants. Instead the Emperors reserved the implementation of the bishops of their proprietary church for themselves, defying the fact that according to canon law they were part of the transnational Catholic Church. This met with increasing opposition by the Popes, culminating in the fierce Investiture Controversy of 1076. Nevertheless, the Emperors continued to grant major territories to the most important (arch)bishops. The immediate territory attached to the episcopal see then became a prince-diocese or bishopric (Fürstbistum). The German term Hochstift was often used to denote the form of secular authority held by bishops ruling a prince-bishopric with Erzstift being used for prince-archbishoprics. Emperor Charles IV by the Golden Bull of 1356 confirmed the privileged status of the Prince-Archbishoprics of Mainz, Cologne and Trier as members of the electoral college. At the eve of the Protestant Reformation, the Imperial states comprised 53 ecclesiastical principalities. They were finally secularized in the 1803 German Mediatization upon the territorial losses to France in the Treaty of Lunéville, except for the Mainz prince-archbishop and German archchancellor Karl Theodor Anton Maria von Dalberg, who continued to rule as Prince of Aschaffenburg and Regensburg. With the dissolution of the Holy Roman Empire in 1806, the title finally became defunct. However, in some countries outside of French control, such as in the Austrian Empire (Salzburg, Seckau, and Olomouc) and the Kingdom of Prussia (Breslau), the institution nominally continued, and in some cases was revived; a new, titular type arose. Germany Prince-elector and Arch-Chancellor of Italy. Duke of Westphalia since 1180. Cologne became a Free Imperial City in 1288. Germany Prince-elector and Arch-Chancellor of Germany. Germany Prince-elector and Arch-Chancellor of Burgundy. Germany Augsburg became a Free imperial City in 1276. Switzerland Basel joined the Old Swiss Confederacy as the Canton of Basel in 1501. A tiny fraction of the bishopric is not now in Switzerland: Schliengen and Istein are both now in Germany; a very small part of the Vogtei of St Ursanne is now in France. France The archbishops had been rulers over Besançon, an Imperial city from 1307, which in 1512 joined the Burgundian Circle. Germany Founded in 948, annihilated 983, re-established c. 1161, continued by Lutheran administrators after Reformation in 1520, secularized and incorporated to the Margraviate of Brandenburg in 1571. Germany Continued by Lutheran administrators after Reformation in 1566 until 1645/1648. Bremen itself became autonomous in 1186, and was confirmed as a Free Imperial City in 1646. Italy Bishop Notingus was made count of Brescia in 844. Poland In 1344 Bishop Przecław of Breslau (present-day Wrocław) bought the town of Grottkau (Grodków) from the Silesian duke Bolesław III the Generous and added it to the episcopal Duchy of Neisse (Nysa), becoming Prince of Neisse and Duke of Grottkau as a vassal to the Bohemian Crown. Switzerland Greatly reduced during the Reformation, when significant parts of Swabia and Switzerland became Protestant. Switzerland De jure Reichsfrei since 1154, de facto dominated by their guardians, the counts of Geneva (until 1400) and Savoy (since 1401). Geneva joined the Old Swiss Confederacy in 1526. Switzerland Conquered by the Swiss city canton of Bern in 1536. Poland Seated in Fürstenwalde since 1385; Reichsfreiheit challenged by Brandenburg, continued by Hohenzollern Lutheran administrators after Protestant Reformation in 1555 until secularization in 1598. Germany Seated in Eutin since the 1270s; Reformation started in 1535, continued by Lutheran administrators since 1586 until secularization in 1803. Lübeck became a Free Imperial City in 1226. Germany Continued by Lutheran administrators between 1566 and 1631, and again since 1638 until 1680. Germany Administered by the Lutheran Electorate of Saxony between 1544 until 1565. France One of the Three Bishoprics ceded to France by the 1552 Treaty of Chambord. Germany Under guardianship of Meissen from 1259, administrated by Saxony from 1564. Czech Republic The Czech bishopric (later Metropolitan) of Olomouc, as a vassal principality of the Bohemian crown, was the peer of the margraviate of Moravia, and from 1365 its prince-bishop was 'Count of the Bohemian Chapel', i.e., first court chaplain, who was to accompany the monarch on his frequent travels. Germany Princely title was confirmed at Nuremberg in 1217. Germany Ruled by Lutheran administrators between 1554 and 1648. Germany Regensburg became a Free Imperial City in 1245. Austria Raised to an electorate in 1803, but simultaneously secularized; see Electorate of Salzburg. Since 1648, the archbishop has also borne the title Primas Germaniae, First [Bishop] of Germania. The powers of this title – non-jurisdictional – are limited to being the Pope's first correspondent in the German-speaking world, but used to include the right to preside over the Princes of the Holy Roman Empire. Germany Ruled by an administrator between 1516 and 1648. Germany Territories to the east of the Rhine were annexed by France in 1681, confirmed in 1697. Speyer became a Free Imperial City in 1294. Germany Territories to the east of the Rhine were annexed by France in 1681, confirmed in 1697. Speyer became a Free Imperial City in 1262. France One of the Three Bishoprics ceded to France by the 1552 Treaty of Chambord, confirmed in 1648. Italy Secularized to Tyrol in 1803. Netherlands Sold to Charles V, Holy Roman Emperor in 1528, after which it was moved to the Burgundian Circle. Founding member of the Dutch Republic in 1579/1581, confirmed in 1648. Germany Continued by Lutheran administrators after Reformation until 1645/1648, when it was continued as a secular and independent principality until its disestablishment in 1807. It became a part of the Kingdom of Hanover in 1815. Germany Worms city rule established by Bishop Burchard (1000–25), episcopal residence at Ladenburg from 1400, held large estates in the former Lahngau region, territories left of the Rhine lost by the 1797 Treaty of Campo Formio, secularized at first to French Empire, finally Baden and Hesse-Darmstadt in 1815. The suffragan-bishoprics of Gurk (established 1070), Chiemsee (1216), Seckau (1218), and Lavant (1225) sometimes used the Fürstbischof title, but never held any reichsfrei territory. The bishops of Vienna (established 1469) and Wiener Neustadt (1469–1785) didn't control any territory, nor did they claim a princely title. 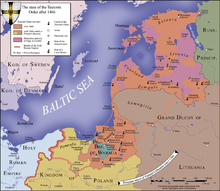 Upon the incorporation of the Livonian Brothers of the Sword in 1237, the territory of the Order's State largely corresponded with the Diocese of Riga. Bishop Albert of Riga in 1207 had received the lands of Livonia as an Imperial fief from the hands of German king Philip of Swabia, he however had to come to terms with the Brothers of the Sword. At the behest of Pope Innocent III the Terra Mariana confederation was established, whereby Albert had to cede large parts of the episcopal territory to the Livonian Order. Albert proceeded tactically in the conflict between the Papacy and Emperor Frederick II: in 1225 he reached the acknowledgement of his status as a Prince-Bishop of the Empire, though the Roman Curia insisted on the fact that the Christianized Baltic territories were solely under the suzerainty of the Holy See. By the 1234 Bull of Rieti, Pope Gregory IX stated that all lands acquired by the Teutonic Knights were no subject of any conveyancing by the Emperor. Within this larger conflict, the continued dualism of the autonomous Riga prince-bishop and the Teutonic Knights led to a lengthy friction. Around 1245 the Papal legate William of Modena reached a compromise: though incorporated into the Order's State, the archdiocese and its suffragan bishoprics were acknowledged with their autonomous ecclesiastical territories by the Teutonic Knights. The bishops pursued the conferment of the princely title by the Holy Roman Emperor to stress their sovereignty. In the original Prussian lands of the Teutonic Order, Willam of Modena established the suffragan bishoprics of Culm, Pomesania, Samland and Warmia. From the late 13th century onwards, the appointed Warmia bishops were no longer members of the Teutonic Knights, a special status confirmed by the bestowal of the princely title by Emperor Charles IV in 1356. Latvia Established about 1234, the smallest of the Livonian dioceses. Secularized in 1559 and occupied by Prince Magnus of Denmark. From 1585 under the suzerainty of the Polish–Lithuanian Commonwealth, part of the Duchy of Livonia. To Russia in the 1795 Third Partition of Poland. 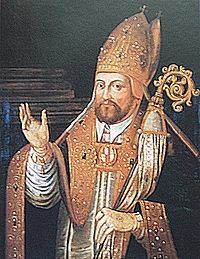 Estonia Bishop Hermann, appointed by his brother Bishop Albert of Riga, received the title of a prince-bishop by King Henry VII of Germany in 1225. Dorpat (Estonian: Tartu) remained a suffragan diocese of Riga. Dissolved in the course of the Protestant Reformation in 1558. Estonia Established on Saaremaa island in 1228 under Bishop Gottfried, appointed by Bishop Albert of Riga, vested with the title of a prince-bishop by King Henry VII of Germany. It remained a suffragan diocese of Riga. Dissolved in the course of the Protestant Reformation in 1559. Latvia Episcopal see at Üxküll 1186–1202. In 1225 Albert of Riga received the title of a Prince-bishop of Livonia by Emperor Frederick II. Last Archbishop William of Brandenburg resigned in 1561 during the Livonian War, territory fell to the Polish–Lithuanian Commonwealth, to Sweden in 1621. Poland Established by Papal legate William of Modena in 1243, princely title documented in the Golden Bull of 1356. Incorporated into the Jagiellon kingdom of Poland in 1466 and re-established as an autonomous prince-bishopric under the Polish crown in 1479. Abolished in the course of the Prussian annexation in 1772 during the First Partition of Poland. The Bishops of Durham were also territorial prince-bishops, with the extraordinary secular rank of Earl palatine, for it was their duty not only to be head of the large diocese, but also to help protect the Kingdom against the Scottish threat from the north. The title survived the union of England and Scotland into the Kingdom of Great Britain in 1707 until 1836. Apart from territories formerly within the Holy Roman Empire, no French diocese had a principality of political significance linked to its see. However, a number of French bishops did hold a noble title, with a tiny territory usually about their seat; it was often a princely title, especially Count. Indeed, six of the twelve original Pairies (the royal vassals awarded with the highest precedence at Court) were episcopal: the Archbishop of Reims, the Bishop of Langres, and the Bishop of Laon held a ducal title, the bishops of Beauvais, Chalôns, and Noyon had comital status. They were later joined by the Archbishop of Paris, who was awarded a ducal title, but with precedence over the others. From 1472 to 1967, the bishop of Coimbra held the comital title of Count of Arganil, being thus called "bishop-count" (Portuguese: Bispo-Conde). The comital title is still held de jure, but since Portugal is a republic and nobility privileges are abolished, its use declined during the 20th century. While one might expect that the Protestant Schism, Counter-Reformation and more modern regimes than the traditional feudal principality would have eradicated the prince-bishopric, this was not quite the case. Even when the true prince-(arch)bishoprics disappeared from the map of Europe as it was redrawn by Napoleon I Bonaparte (who caused the end of the Holy Roman Empire) and the Congress of Vienna after his defeat, the title found a new, titular use. In the Habsburg dynasty's "new" empire, the Danubian double monarchy of Austria-Hungary, reduced to the parts south of Prussia's (German) sphere of dominance that would become the (largely Protestant) German Empire, actual territorial power was no longer held by the bishops, but the status of Fürst(erz)bischof was maintained, and could be given a similar political role in the more modern, almost standardized Cisleithanian provincial level, the Kronland (crown land), as ex officio members of its Landtag, the representative and legislative assembly, often with Virilstimme, while other bishops could collectively be represented as a "prelate's bench" (an elected Kurie). The Emperors of Austria now bestowed the title upon bishops even without any feudal principality, but as a princely style and rank (as had been usual for centuries with secular noble titles of peerage ranks) awarded to episcopal sees, carrying the privilege of a seat in the estates, e.g., for the bishop of Laibach (as a consolation prize for the see's loss of metropolitan rank to Görz), the archbishop of Vienna (probably due to Vienna's rank as Imperial residence) and for the archbishop of Esztergom (here reflecting his longstanding role as the first magnate of Hungary). The ultimate prince-bishop is the Bishop of Rome, i.e. the Pope, universal head (Supreme Pontiff) of the Roman Catholic Church. His claims to territorial power were bolstered by the forged early-medieval document Donation of Constantine, and the authentic Donation of Pepin, establishing the Patrimonium Petri which was further extended as the powerful Papal States. Pope Pius IX was the last of the true, sovereign prince-bishops, divested of territorial powers when the Papacy was forced to surrender the rule of Rome in 1870 to the united Kingdom of Italy, which was supported by liberal-nationalists. The pope however re-gained sovereign power over Vatican City in 1929 after successful negotiations with the Italian government under Benito Mussolini, leading to the Lateran Treaties. The Catalan Bishop of Urgell, who no longer has any secular rights in Spain, remains one of two co-princes of Andorra, along with the French head of state (currently its President).